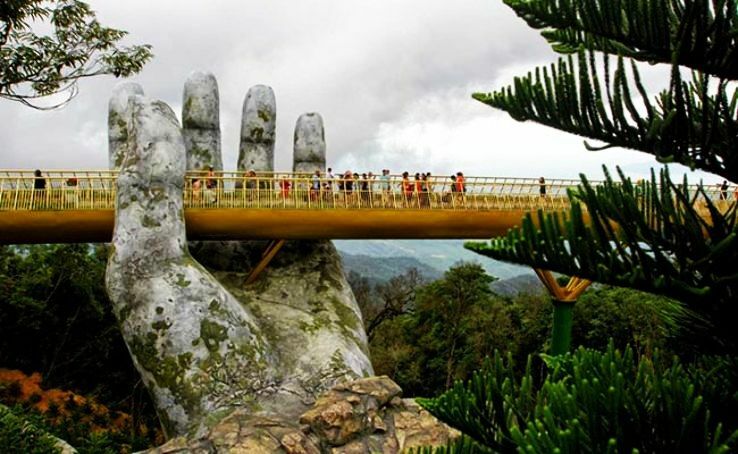 When we talk about the dream world and the amazing ride to it then we can definitely not miss on to the Golden Bridge in Vietnam. This bridge is no less than an iconic figure which you have not seen in any other part of the world. This new footbridge is held up by two giant hands which look like the Gold is holding the bridge. It is just inaugurated near Da Nang in Vietnam. It is one of the recent one and the most wonderful creation which is now a part of this world. 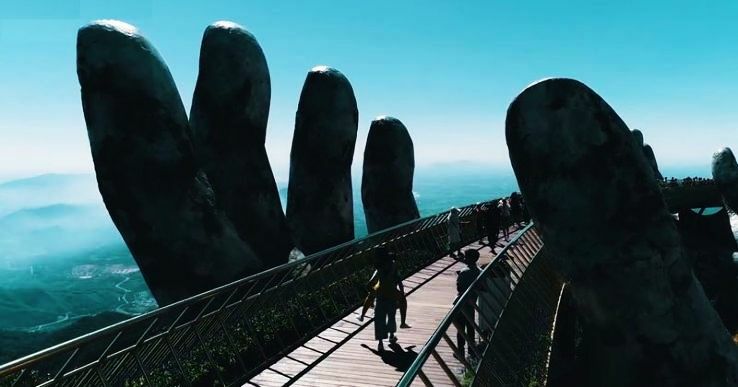 The two enormous stone-coloured hands have an opening in the Ba Na Hills, near Da Nang in central Vietnam. It is one of most recent in the list of the statement footbridges present around the world. The Golden Bridge is also called as Cau Vang. This bridge was open to the public in June 2018. It is 150 meters long and 1,400 meters above sea level. You can see the clear view of green mountains which is simply amazing. The initial designs of this bridge were given by TA Landscape Architecture and it took almost a year in the complete making of the bridge. In the early 20th Century this place was a retreat, a place to cherish for the ruling French community but later on, it fell into ruin after there was a revolution against colonial rule in 1945. At present this area is devoted to French village and gardens, along with a 5.8km cable car track which is actually one of the world’s longest and highest one. It is a cavernous existing amusement complex which is hidden beneath the kitsch-looking village. Leftover of the previous present villas has been spotted by travelers who have been riding the cable car. Near to this place, there is one faux castle and cathedral which are basically the beautifully decorated gardens and a wax museum featuring statues of Lady Gaga and Michael Jordan. If we talk about the previous year statistics nearly around 13 million foreign visitors were present there and most of them were from China. 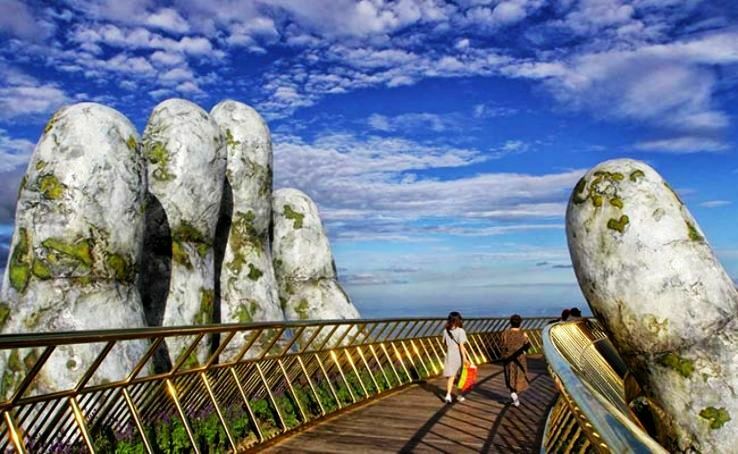 Anh, the designer of this Golden Bridge said that he already has another project in the works: a silver bridge made to look like a god's strand of hair that will connect to his existing structure in the Ba Na Hills. He hopes that he will be able to create that masterpiece and people would love him even more after that. The maximum popularity this bridge has gained is because of the social media as it is a great hype over there. Its beauty and wonderful structure have created quite a great impact on the minds of the people. The location was not getting a lot of interest but after the making of this bridge, it has become quite a famous tourist attraction. So this golden bridge is actually an amazing piece to see as it is something like its own and we hope many such things will be made in the world like this.